If you are politically inclined (or old enough to remember 🙂 ) you may recall the greatest moment in the history of Vice Presidential debates – Reform Party candidate, Admiral James Stockdale, began his opening remarks by saying with a somewhat quizzical demeanor, “Who am I? Why am I here?” Of course, before he could launch into his well polished remarks that would follow the audience interrupted with spontaneous laughter. 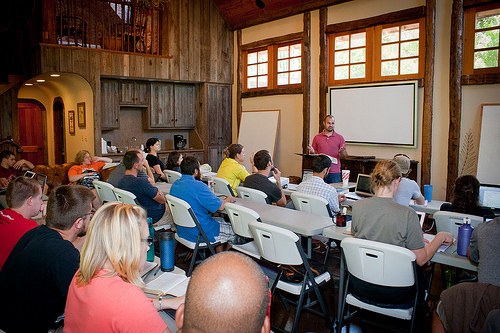 Well, I could not help but think of that great moment as I stood before the missionaries at the Center for Pioneer Church Planting as I begun to teach my five hour course on an Introduction to biblical parenting. Yes, if you know our family well you know the fruit of joyful obedience Betsy and I have seen in our young children from practicing the principles we believe the Bible lays out for parenting. However, all we have done is search the Scriptures and get a lot of advice and best practices from parents who do this biblical parenting thing far better than us. Betsy and I are still learning so much and I pray we always are because raising our children in discipline and instruction of the Lord is the most important ministry we have. We cry out to God for His mercies in this endeavor! At any rate, the class was a huge success. The missionaries were engaged, encouraging, and were very vocal about how much they learned. Many of the ideas and methods I presented were new to this group largely of young parents. I pray that in response to what they learned they are better parents, better missionaries, and most of all better disciples of Jesus. A missionary gave me this note of encouragement specifically to share with Betsy and my partners. I was blessed and astounded when I read it! Below is a quick summary of what I taught. If you would like the complete packet of notes (7 pages) just email me and I would be happy to send them. – The goal of parenting is to make disciples of Jesus Christ who will go out into the world and extend His Kingdom (Matt 28:18-20; Psalm 127:3-5). The first step in that is teaching them to honor and esteem YOU. Winning at home does not happen by accident or through apathy. It takes diligence, perseverance, consistency, death to self, faith, and prayer. God is the ultimate authority in our house and therefore our family will be governed by His Word. He has placed me, the husband, as the human authority/leader over my family. He has ordained Betsy, my wife, to be my helper alongside me in equal standing before God. He has placed both of us as the authority over our children (Col 3:18-21). Children are given two simple tasks in Scripture – Obey and honor (treasure) their parents (Ex 20:12; Eph 6:1-3; Col 3:20). Having and living a biblical understanding of roles, authority and leadership creates an environment where God’s Word can be lived out and thrive in the family. Failure to understand and live out God’s design for the family structure leads to child-centered homes where whining, crying, chaos, and exhaustion reign. – Most of us need to raise our expectations regarding our children’s obedience and train them to those expectations. Children have an incredible ability to perform to expectations. We discipline because we love our children and want what is best for them understanding discipline produces wisdom which will profit them now and throughout the rest of their lives. We discipline because we want our children to understand that sin has consequences. We discipline because we understand that disobedience breaks fellowship (vertically and horizontally). We discipline because we want our children to be obedient to the biblical command to honor their parents. Contrast Proverbs 29:15 with Prov 31:28. As believers we have the responsibility and privilege of bringing our children up in a home where the Word of God is cherished, honored, spoken, and most importantly lived out. Husbands/fathers are called to lead their families spiritually (Eph 5:22-6:4). We must make intentional time to make this happen. Family worship is the best way to do this. The local church is a gift from God to equip us for our ministry at home (and elsewhere of course); encourage parents and children in the faith, knowledge, and love of our Lord Jesus; instruct us in the Word, live out a life of fellowship with other believers; shepherd us to good waters; and care for the physical and spiritual needs of others; etc. Thank you for this blog post. Praying for you all. Excellent Trevor. This should make a big difference. Thanks, Trevor. This was really encouraging for me to read as Josh and I are trying to become more godly in our parenting. If you have the time, we’d actually love to study through those 7 pages of notes. 🙂 Thanks! Laura, I am glad it was encouraging! You and Josh have the blessing of being surrounded by a lot of great examples including your parents. I will send the notes right over.